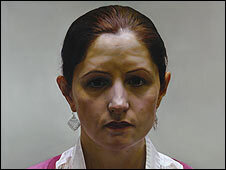 Artist Craig Wylie has won this year's BP Portrait Award for a large oil painting of his girlfriend. The 35-year-old London artist won for K, depicting his partner Katherine Raw, which beat 1,726 other entries. He won £25,000 and a £4,000 commission from the National Portrait Gallery. Chinese-born student Peiyuan Jianga took the young artist award. The award, now in its 29th year, was announced by broadcaster Ian Hislop at the National Portrait Gallery. The £8,000 second prize went to Simon Davis for his portrait of friend Amanda Smith, which was influenced by French artist Toulouse-Lautrec. Robert O'Brien, 30, took third prize for Hannah O'Brien, a picture of his grandmother. National Portrait Gallery director Sandy Nairne said: "These are superb portraits, each of the 2008 prize winners being a different scale and style. Painted portraiture is flourishing." Zimbabwe-born Wylie had made two previous attempts at the painting in 2006 before starting the winning version of the epic oil canvas last year. Wylie said of the painting: "On one level the viewer's intrusion into the sitter's emotional state is tacitly accepted. On another it is positively rebuffed."